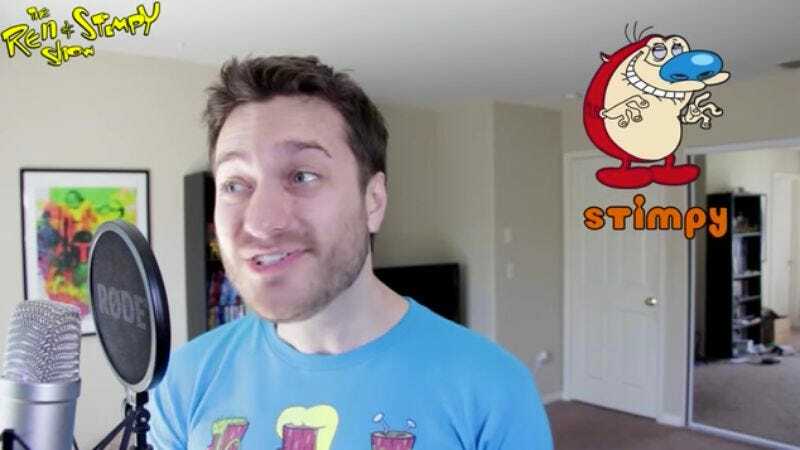 The newest video by prolific YouTube comedian/impressionist Brock Baker brings back all of your favorite (and some forgotten) characters of ’90s Nickelodeon. The charming and frenetic video features household staples Ren and Stimpy but also reaches a little further with CatDog’s Dog (no word on Cat’s whereabouts) and the terrifying but sweet Krumm from Aaahh!!! Real Monsters. A highlight of the video comes at 1:45 with characters from the 1993-96 series Rocko’s Modern Life. Rocko, a character known for his empathy and compassion, is turned into a minor terror as he berates and cusses at his best friend, Heffer, who is rightly confused and hurt by the behavior. Mrs. and Mr. Bighead jump in to protect Heffer, and Rocko quickly apologizes while Filburt rides out a wave of nausea, probably brought on by his friend’s sudden change in personality. It’s a coherent scene of humanity in the middle of a video that could have easily gotten away with being a slapdash compilation of voices. However, Brock “The Man Of A Kajillion Voices” Baker likely knows the internet better than to assume a funny voice and some animation will garner anything more than—if even—a like. The “scene” between Rocko and friends evokes a memory for those familiar, but it also works to bring the existing property into 2016 without losing the original quirks. Simply, it will always be fun to see—and hear—a retro cartoon character cuss.